The most renowned and feared chef in the world loses his title of God of Cookery because of his pompous attitude. Humbled, he sets out to reclaim his title. The God of Cookery, a brilliant chef who sits in judgement of those who would challenge his title, loses his title when a jealous chef reveals him to be a con-man and humiliates him publicly. As this new chef takes on the God of Cookery's role, the former God tries to pull himself back on top again, to challenge his rival and find once and for all who is the true God of Cookery. The most renowned and feared chef in the world loses his title of God of Cookery because of his pompous attitude. Humbled, he sets out to reclaim his title. Another terrific film from director/star/co-writer Stephan Chow, the highlight of which are scenes involving The Eighteen Brassmen of Shaolin Monastery, whom provide for particularly inspired comic moments in a movie full of them. Like his breakthrough film in the west, Shaolin Soccer, this film incorporates martial arts into an area not associated explicitly with them. However, The God of Cookery is not as much focused upon cooking as it is upon an ever-expanding group of oddball characters. The most wonderful thing about Chow as a director is that he doesn't simply use them as vehicles for gags but really allow them screen time to do their thing, even if it is just a throwaway role in the film (the 'ugly chef' who is in the very first scene is a good example). This includes ugly duckling/love interest Turkey, whose absurdly brutal personality and violent behaviour is so incredibly funny because Karen Mok, the actress playing Turkey, portrays her so honestly and without guile. There is none of the incredibly unfunny, strained-'trying to be funny' or ironic acting often found in recent American comedies. Chow is apparently a huge fan of Bruce Lee, but his work seems to take as much from Charlie Chaplin, a guy who knew how to be serious-ly funny. Anyway, if you enjoyed Stephan Chow's other comedies or are up for some joyfully absurd silliness, look around for this one, it's worth the effort. 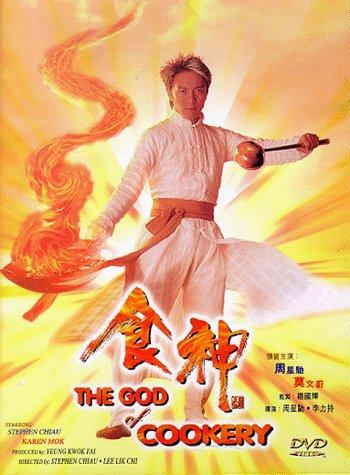 I'm quite a big fan of Stephen Chow's newer work, from King of Comedy to Kung Fu Hustle. But God of Cookery just didn't work for me. Of course there was some good fun in it, but there was also far too much vulgarity and other tasteless forms of humor that I happen not to appreciate. The worst, though, was that the story was so messy. There was hardly any structure to it (and of course the absolutely abysmal subtitles ruined even more of it), and it wasn't clearly told at all. Quite simply, not a very good movie. I can understand why Chow's movies didn't get popular outside of Asia until the brilliant Shaolin Soccer. My rating: 4 out of 10.